Fassolia Piaz are white beans boiled and made into a salad. There are a lot of variations of this salad but we like it with tomatoes, onion, tuna, parsley, served with olive oil and lemon juice. I also like making the same salad with fassolia mavrommatika (black-eyed peas). Beans are considered to be the national food of the Greeks. I do not know the story behind this, maybe it is because they used to eat them a lot, but according to food historians, fassolia and fassolada has been around since ancient Greek times. However, years back they used to call beans “the meat of the poor” as beans are rich in proteins. Our recent ancestors who used to eat meat once a week were considered amongst the privileged. Before Word War II Greece relied a lot on agriculture and agricultural products which were very cheap at the time. On the other hand the live stock bred was channeled to the cities to be consumed by the rich. After the World War II, the Greeks suffered a lot and many people starved to death, as in many other countries as well. Gradually a post war syndrome developed which has made the generation after the war to change their nutritional habits because of the abundance of products available. Nowadays, we consume a lot of meat and eat dried legumes and vegetables once or twice a week. We seem to be losing track of the Mediterranean nutrition which is considered to be the best in the world. So we have to put vegetables and dried legumes again on the top of our list if we want to be healthy. In Greece, we prepare beans in many ways and this is one of my favourites. 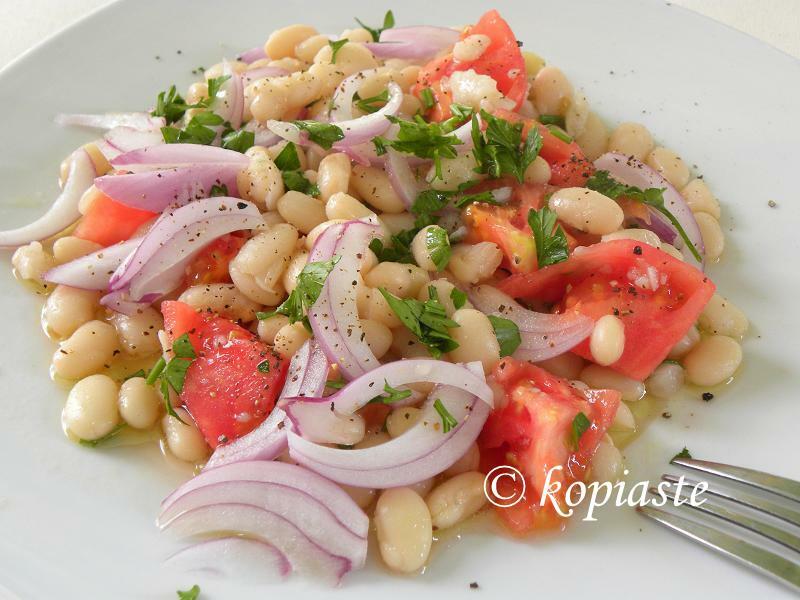 Fassolia Piaz, is a simple bean salad, which is perfect for summer, as it is eaten cold with lots of vegetables. Next day strain, add fresh water and boil. When they start boiling foam is formed on top which remove with a slotted ladle. When this is done, strain them again and put fresh water to cover the beans. When they start boiling, add salt, reduce heat and simmer for about 1 – 1 ½ hours covering with lid, until they are soft. When they are cooked, let them cool down and strain them. Add olive oil, lemon juice, taste and adjust salt if necessary and sprinkle some black pepper on top. Serve with all the other ingredients i.e., tuna, finely chopped tomato, onion and parsley, oregano. If there is fish in the menu, skip the tuna fish in the salad. When they are cooked, strain them and let them cool. The same salad can be made with black-eyed peas but in Greece, it is not necessary to soak them overnight. However, follow the instructions on the package as some varieties need to be soaked. During Lent when we do not eat fish, I substitute tuna with avocado. Very nice food. It is very easy to prepare and above all, it is perfect for a healthy diet. Add to the salad some extra-virgin olive oil (the best of which is produced in the Mediterranean countries, especially in Greece) and it is ready! Kali Chronia to you as well. Simple but so tasty, especially if you can get fresh and tasty ingredients to put the dish together. A wonderfully simple salad yet I’m sure delicious. Question, if the tuna is packed in oil, discard it (oil) or add it to the salad? We always discard it and add extra virgin olive oil. This is my kind of food. Sounds very healthy! Thanks for sharing, Jenny. Me too. love the white beans. great recipe. Greek white beans. This looks so healthy and delicious. Thanx for the recipe. Brilliant. The recipe looks great and very delicious..thanks for the post.